P4 - Sustained physical effort calls for a state of high conditioning. You should already have experience of tough challenges (P3) and be regularly training as part of your normal routine. Expect days of up to 8 hours and longer while carrying a pack up to 8-14kg in weight. Summit night could be easily in excess of 12 hours. T4 - A good grounding in Alpine climbing is ideal. Knowledge of basic knots and ropework with a background in Scottish Winter II or Alpine PD. Competence use of crampons and self arrest techniques is preferable. All still will be re-taught and practiced in situ. The Matterhorn, (4,478m) sometimes called ‘The mountain of mountains’, is one of the most instantly recognised and iconic peaks in the world. It roars out from the surrounding Alpine landscape and grabs the attention of everyone stepping off the train at Zermatt in Switzerland. 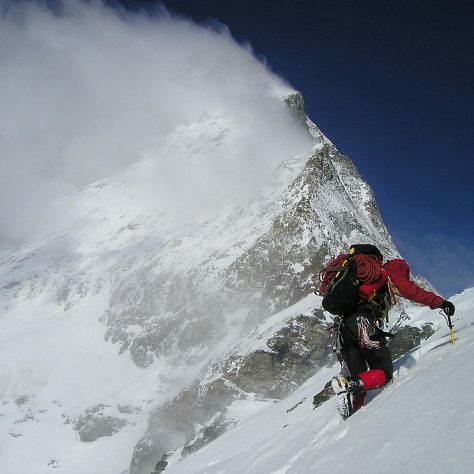 Dramatic and awe-inspiring, it has for centuries been a major tick for mountaineers worldwide. Make this ascent yourself with our superb 360 Mountain Guides who know, and need to know, this route backwards. You don’t have to be a brilliant climber to summit the Matterhorn, but you do have to be able to move over some extreme scrambling terrain quickly and efficiently and have some previous moutaineering experience under your belt. The Matterhorn is steep and serious on all sides, and combines technical rock ridges, graded at Alpine AD, with high altitude. We climb the Hornli Ridge from Switzerland on a 1 guide to 1 client ratio. This itinerary is an outline, and the day-to-day running will depend on local conditions, and the fitness and dynamics of the team. It is designed to give you the very best chance of summitting. We’ll give you luxurious down time lodging and meals, the best acclimatisation possible, the most thorough training, and fully qualified Mountain Guides. The rest is up to you. Meet in Chamonix to discuss the week ahead, check equipment, and answer last minute questions. We use Chamonix to warm up for the peak simply because it is less eye-wateringly expensive than being in Zermatt. Likely objectives could be the Arete Cosmiques or Point Lachenal from the Aiguille du Midi. Another training and acclimatisation day above Chamonix. Likely itinerary would be the traverse of the Entreves. We will probably spend the night in a high mountain refuge to aid acclimatisation. We will have an early start from the refuge, likely climbing a peak like the Tour Ronde via the South East ridge. This is a mixture of snow and ice climbing, with some rock climbing thrown in too, and is ideal preparation for the Matterhorn. We leave Chamonix early in the morning, and head to Zermatt. Once there we take the Klein Matterhorn lift to Schwarzsee, and then make the 90 minute ascent to the Hornli Hutte. The climb from the Hornli Hutte is over 1,200m of ascent. Almost immediately after leaving the Hornli Hut we begin climbing. Most of the terrain is steep scrambling, but there are sections of fixed rope, higher on the route, where you will have to climb “batman style” upwards. Just over half way up we will reach the Solvay Bivouac where we will stop for a break and assess our progress. If we are not keeping to good time then this is a logical point to descend from. We usually put crampons on 2/3 of the way up where the ground becomes snowy. From there to the summit the terrain is more serious, with fixed ropes on all steep sections. The ability to use your crampons effectively is essential. Summit day on the Matterhorn is usually 9 – 12 hours return journey to the hut. Then an easy walk down the path to the lift for 1 hour . In case of bad weather we allow a spare day. This significantly increases your chance of summitting. If we don’t need the spare day we will complete another day of alpinism or rock climbing. After the peak we will return to Chamonix. Today we fly back home. For protection against the inevitable snorers! How much water should I carry each day? Do not carry too much water – it is very heavy. As a general rule 1-2 litres is the right amount. Avoid using Camelbak style systems with drinking straws. They leak, the tubes freeze, and they will always let you down when you need them most. Nalgene style plastic bottles are the best. What type of food should I carry? Everyone is different, however it is essential to eat well in the mountains. Sandwiches are hard to beat, supplemented by fruit and chocolate bars. Don’t carry too much food, and remember that some foods will freeze solid unless kept in jacket pockets. Where can I get a packed lunch for each day? You can buy a good packed lunch directly from the chalet. Please let them know the day before. What are the mountain huts like? Mountain huts are mostly owned by the Alpine Clubs. They are there to provide accommodation and food for mountaineers. They often cater for large numbers (>100), and hence can be quite busy. Meals are usually simple but plentiful, and anyone with special dietary requirements must let us know in advance so we can inform the hut guardian. Please note that while huts will usually try and accommodate vegetarians etc they do sometimes struggle with more specialised requirements such as gluten free. Showers and running water are not usually available. Meals, drinks, and snacks can be purchased for cash. As an indicative cost, a 1.5 litre bottle of mineral water typically costs 6-9 Euros and a bar of chocolate 2 Euros. The rooms are usually dormitory style, with large alpine bunks (up to 15 people in a row). If there is no water in the huts for washing, what should we do? Take some wet wipes to give yourself a clean in the evening. A toothbrush, some wet wipes, and a small tube of toothpaste (shared between several people) is plenty. Some alcohol hand gel is also handy. An overnight laundry service is available in the chalet for essential items required for the summit phase (thermals and socks etc). Please note a small charge is levied for this service. Do we have to move out of our rooms when we are on the mountain? No. Your room in the chalet is yours for the week and is your home away from home. How easy is it to get out and about? Guest cards will be issued upon arrival which means the local buses and trains are free of charge if you fancy trying out the public transport. The chalet is also licensed to provide a private in-resort taxi service at a cost of €25 per journey in the valley. What sun cream do you recommend? Any brand will be fine. The most important thing is the SPF – Do not bother with anything under SPF 30. Creams with UVA and UVB protection are best. And don’t forget lip salve. Is it really necessary to spend so long acclimatising? Yes. Acclimatisation is absolutely vital for Matterhorn. Many people spend insufficient time up high before attempting the summit, and often fail as a result. Failure to acclimatise properly can lead to sickness and even death. Bring kit as outlined in the kit list. Can I hire equipment in Chamonix? The length of days will vary when Alpine climbing. Training days will usually start between 06:00 and 08:00, and last for 6-8 hours. Mont Blanc summit day will usually start very early (around 03:00), and can easily last 12 hours. How does every company claim to use the best mountain guides? 360 always use the very best mountain guides possible. But then every company says that don’t they? To ensure we genuinely do use the best guides, we pay our guides more than any other guiding company operating on Mont Blanc. That way we always have the pick of the very best. Are all mountain guides certified? All guides operating in the European Alps must be internationally certified. Training and assessment takes a minimum of three years and anyone caught operating without a license will be prosecuted. Occasionally we employ trainee guides (known as Aspirants). They are in the final stages of qualifying as guides and are allowed to operate under the tutorage of a fully qualified Guide. What if we summit early? If you summit early you may have a spare day in Chamonix. If so, there are numerous options for rock climbing, via ferrata, or alpine climbing for the day. The group would not all have to do the same activity as we would still have 1 guide per every 2 team members. There are also plenty of less physically demanding options in or near the Chamonix Valley. What if the conditions are too bad to attempt the summit? If conditions are really bad we will find an alternative plan. This would usually involve climbing in either Italy or Switzerland. If possible we would still try and climb a major peak >4,000m high. How do I get from Geneva Airport to Chamonix? Please contact the 360 office for advice on transfers. There are many options available. Will I need an European Health Insurance Card (EHIC) for this expedition? It is worth having a European Health Insurance Card (EHIC) as this “gives card holders the right to access state-provided healthcare on temporary stays in European Economic Area (EEA) countries or Switzerland. Treatment should be provided on the same basis as it would be to a resident of that country and is provided either at reduced cost or, in many cases, for free. The EHIC covers treatment that is medically necessary until the card holder returns home. This includes treatment for pre-existing medical conditions.” If you don’t already have one, you can apply for one here and it is free. Many travel insurers won’t cover your medical costs in the unlikely event that you need medical treatment whilst you are away which could have been covered by an EHIC. Avoid carrying bulky SLR style cameras. They are too heavy, and slow to use. Compact cameras that fit into a pocket are best. Cameras in rucksacks never take photographs! Digital cameras must be kept warm in a pocket or they will freeze and cease to function. As far as 360 are concerned, I found their team professional, informative and always willing to help. I found their team work their arses off to make the magic happen!